I have been an automotive technician since 1997. Most of that time has been spent running a car repair business with my father. I have broad experience with Domestic, European, and Asian cars, with jobs including alternators, electrical issues, brakes, Check Engine Light diagnostics, fluid maintenance, and much more. I look forward to assisting my customers with all their automotive needs! Wonderful Guy, knows what he is doing and has the knowledge and experience to back it up. Understand automotive problems and can easily diagnose them. i had my window regulator changed (again). Mitchel did it both times on my SUV, and did such a great job. He is always fast and efficent. He does an excellent job, and does not hesitate to help out if something extra is needed. I am a repeat customer, and will call him back again, because i have another another window that is bad again. He truly knows his stuff. Great work! Will be booking again! He provided outstanding service and would recommend him to anyone in my area. I hope to see him again soon. Showed up on time and did great work. Mitchel worked hard the entire time he was there with no time wasted. He got the old starter out and the new one in and my car fired up like a champ. He explained what he was doing thoroughly and answered every question I had. An amazing and professional mechanic. Very dependable and amazing with customer service! Top notch! Always does a great job. Mitchel was on time, listened to my explanations and was very in fact extremely courteous and explained everything. I am never going back to my dealership. So impressed. Thanks Mitchel. See you soon for the other repairs. Excellent customer service. Professional, honest and knowledgeable. He is a great great mechanic. He really knows his stuff. This is my 4th time using him and he has come thru every single time. Good demeanor and competent. 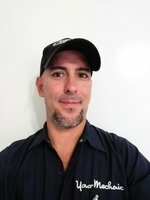 Mitchel himself can fix a variety of items (window regulators, brakes, starter motors, oil changes, etc). User should know that some technicians can work on additional services (eg AC, etc - which may be more complex). I rates him a 5 star for the service he provided. Mitchell was beyond amazing. He was very professional and knowledgeable. Mitchell was very professional and cuortius. He did an excellent job and gave me good recommendations. Very nice person, he was great! He is very professional and gives great advice and explains all of what he will do to the car. Will show you what’s wrong and explains to you what is to be done. Very friendly guy, professional and truthful. Highly recommend him. My First time using service, (Scheduled for Sunday) Showed up on time, explained scope of work, during install started raining and still worked thru it! Very professional would definitely recommend! Thanks for keeping the work horse on the road! Mitchel was very friendly and professional. He did a very thorough pre-purchase inspection of the vehicle.